The Thunderbolt 3 PD Dock is designed for extra connectivity demands. With this docking station, you can extend the connection of a computer to more USB peripherals such as Ethernet network, the speaker and the microphone. 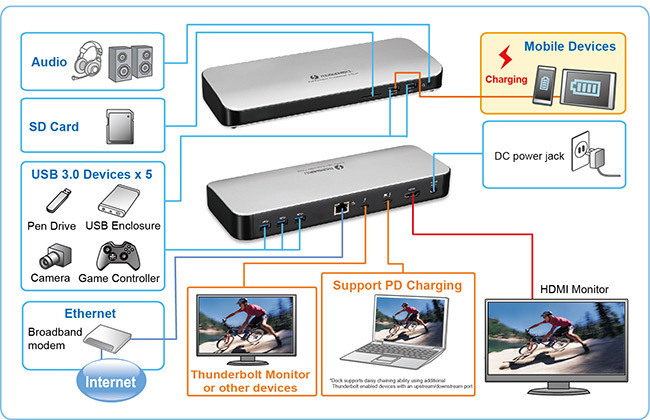 Adopting PD Charging technology, upstream charging function through Thunderbolt interface, you can charge the laptop. In addition, the driver is included in the docking station; therefore, you do not need to install extra drivers. Just plug and play; then you are connected with Thunderbolt embedded device. The docking station is also equipped with video output. With HDMI port, you can mirror your primary screen or extend the desktop allowing visibility of more applications at the same time. With enhanced expansion capability and video output function, this docking station is the most versatile accessory that also complements your home or office space.